Forced oscillation is a method to measure respiratory mechanics by use of small-amplitude pressure oscillations, which does not require the execution of forced respiratory manoeuvres. Anaesthetised and intubated/cannulated animals are connected to the eSpira system. Ventilation (volume or pressure controlled) is then started, and the eDacq protocol is run to ensure that the experiment is carried out in a consistent manner. At the end of each run the data will be automatically summarised and saved to GLP standards. Pressure-limited TLC or a hyper-ventilation to recruit the airways and ensure stable baseline. Volume and/or pressure controlled PV loop with Salazar Knowles data fit on expiration. Snapshot resistance for single compartment model, by use of single sinusoidal frequency for resistance, compliance and elastance. Primewave manoeuvre, which contains up to 19 multiple frequencies to provide a complex understanding of the lung impedance (values defined as G and H). Aerosol delivery, timed and controlled by the protocol to deliver drug or a constriction agents. Can be synchronised with ventilation. 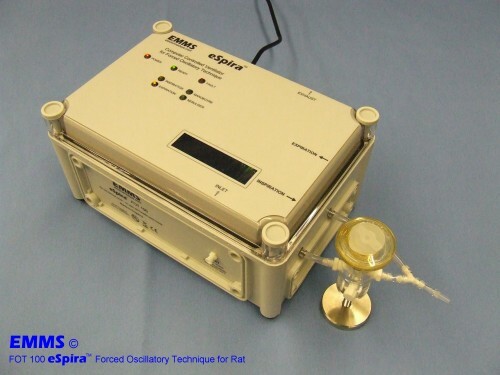 eSpira builds on EMMS’ experience of forced oscillation systems, and uses the principals first published in the 1980s.